Polaris ATV Plow Systems - Buying Tips and Best Buys. 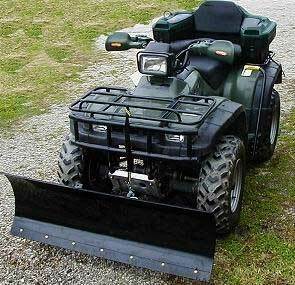 Thinking about a Polaris ATV plow system? Not sure which system you need? Don't know where to find the best deals, or even what you should expect to pay? 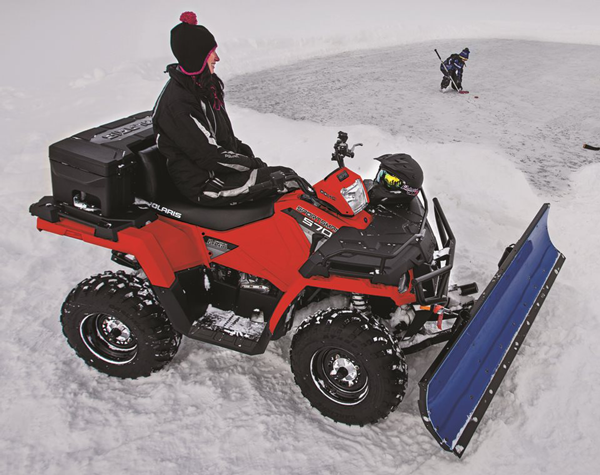 Then follow along and we'll get you up to speed with this quick guide to ATV plows. There are several systems available but they all have a few things in common. Plow Blade - The business end of the system. Usually made of aluminum, steel, or some type of plastic. Blade width is optional with the narrower blades working best on lower powered ATVs while the wider blades would require the extra power and weight of a larger ATV. Work other than light snow plowing would be best handled be a steel blade. Buying Tips and Best Deals. Control Mechanism - Three basic types: Manual - Winch powered - Electric. The type of control has the most to do with the cost of the plow system. Manual controls are the least expensive but may actually be the most complicated. A lever system is used to raise and lower the plow blade by hand. All the linkages add to the complexity. Most manual controls work best on the lighter weight ATV plows. Controls that use the winch cable for raising and lowering the blade are the most popular. Prices fall in the middle of the three systems. These have most of the functionality of the full-on electric systems and less complexity than the manual controls. Biggest problem is increased wear on the cable. Electric controls are independent of the ATV and self contained with the plow system. If you use a Polaris ATV plow a lot or have heavier duty chores to do - the extra cost may be justified. This type of control costs several hundred dollars more, but is definitely the deluxe way to go! Mount - This part of the plow is just what it says. The mount for the plow attaches to the frame of the ATV and provides attachment points for the plow blade. Some mounts come with quick release features and the ability to adjust the blade height and angle on the fly. Naturally, the more features, the more money. Check out these videos to get a better idea of how an ATV plow system works. Where to Find the Best Deals. Now that you know everything about ATV plows, the only thing left is where to find the best price on the system you want. We check prices often and the best ones we've seen lately are still at Ebay Motors. There is usually a good selection offered by several good sellers. We included a link to the best deals below. Just stay with highly rated sellers and be sure to ask questions if you aren't sure about something before you bid or buy. That's what we do and have never had a problem.